The redesigned X3 has what BMW is calling its "three-dimensional" kidney grille and hexagonal fog lights, the first use of that face on one of its X models. The redesigned 2018 BMW X3 will go on sale at Canadian dealerships with a few subtle differences from the U.S. version in November, underpinned by a new architecture and with a new M Performance model in the nameplate's lineup for the first time. BMW Canada officials announced details of the redesigned X3 late Monday evening, after the U.S. model was unveiled at the company's massive assembly plant in Spartanburg, S.C., as part of an event celebrating the 25th anniversary of the company's announcement of its intention to build the plant. BMW assembles the X3, X4, X5 and X6 models in Spartanburg, and the large X7 crossover will also be assembled there when it begins production more than a year from now. It is BMW's largest production plant globally and exports 70 per cent of its vehicles to 140 markets worldwide. With the 2018 model, the X3 moves to BMW's versatile CLAR architecture, a lighter-weight modular system that already underpins the 7-series sedan and will be used on several other nameplates. Now in its third generation, the X3 generally maintains its overall exterior dimensions although its wheelbase has grown by five centimetres (2.2 inches). The redesigned X3 sports what BMW is calling its "three-dimensional" kidney grille and hexagonal fog lights, the first use of that face on one of its X models. It's lighter, more powerful and more efficient with improved handling and driving dynamics, BMW says. It has the company's full suite of driver assistance technologies. At launch, BMW will sell two models, the X3 xDrive30i and the top-of-the-line X3 M40i. Pricing will be announced closer to the sale date. 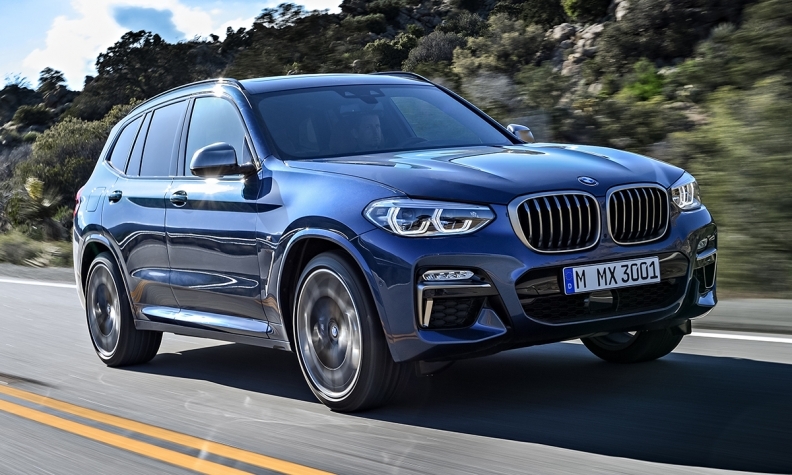 The xDrive30i is powered by a 2.0-litre turbocharged four-cylinder engine producing 248 hp, while the M40i is powered by a 3.0-litre turbocharged inline six-cylinder engine producing 355 hp. “However, equipment levels/option packages are typically unique to the U.S. and Canadian markets,” he said. The biggest differences are in the wheels. In its basic specification, the all-new BMW X3 comes with 19-inch light-alloy wheels in Canada while wheels up to 21 inches in diameter are available depending on the equipment and engine variant. In the United States, 18-inch wheels are the basic standard. The M Sport package in Canada will be available with only 20-inch wheels while there is a lower and cheaper option of 19-inch wheels in the United States. The Standard X Line package has a similar difference, which sees the Canadian version equipped with only 19-inch wheels, whereas there are 18- and 19-inch options south of the border. With a fresh product in the premium compact crossover segment, BMW has a chance to kick-start its growth in the segment. The X3 has been one of the better selling vehicles for BMW Canada early in 2017, with sales up 13 per cent through the first five months of the year even though the vehicle is at the end of its life cycle. X3 sales rose nearly 40 per cent in 2016 to 5,417 vehicles.